(CNN) -- Lori Davis remembers a time when the doors were always open at her church -- and not guarded. 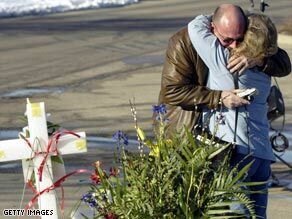 Relatives mourn after a gunman opened fire at a church meeting in Brookfield, Wisconsin, in 2005. "No one thought twice about their safety. I guess we took it for granted," said Davis. But things have changed. In an era when terrorism threats and deadly shootings at schools and churches have made headlines, religious leaders are rethinking their security strategies. Last Saturday, a minister was fatally shot and another man wounded outside of a church in Kentucky where the men went to attend a funeral. Such violence has houses of worship evolving from the days of walkie-talkies and video surveillance to armed guards, who keep a watchful eye over worship services and church. "We live in a sinful world and people do crazy and irrational things," said Davis, a member of the Highview Baptist Church in Louisville, Kentucky. "I'm much more comfortable knowing they're there if needed rather than just hoping for the best," Davis said. Highview also has a medical team on the grounds during weekend services, when thousands of people pass through its doors. Every member of the security team, from ushers to medics and armed guards, receives some kind of training related to their post, be it conflict management or anti-terrorism tactics. "We realized that, as the largest Baptist church in Kentucky, we'd be a little naïve to think something would never happen to us," said Highview Pastor Randy Record, who is also a police officer. "We're catching up in an era of terrorism and a church is no different." Many Highview worshippers say they are comforted by the fact that there is a focus on security. "There are no safe places anymore. Something could happen to me in church just as easily as at home or in the grocery store," said Sheri Mock. "But I don't worry, because I feel secure in church with the program they have." In the past five years, business has consistently "picked up" for Dale Annis, founder of Church Security Services, a consulting company that advises houses of worship on security strategies. "You have to take some of the incentive yourself. I don't think you walk down dark alleys in bad parts of town and say 'God will protect me,' " said Annis, who is also in charge of security at his parish, the Olive Drive Church in Bakersfield, California. In states where people are allowed to carry concealed weapons, volunteers have become a cost-effective means of providing the security that some churches have come to rely on, Annis said. Safety consultants stress the importance of using volunteers who are trained in armed confrontations, such as retired or off-duty law enforcement officials, to ensure that firearms are used as a means of last resort. "I want churches to consider heavily the burden of responsibility of protecting people," said Glen Evans, a consultant who also is a member of the safety team at his church in Centerville, Ohio. "If you have people using guns, they need to be trained to know when to use them." The leadership at the Lincoln Berean Church in Nebraska recently hired an off-duty police officer to complement its security team as an armed presence during major events. The church already has a volunteer staff whose job is to serve as both a "welcoming presence" and extra "eyes and ears" during hours of operation. Jeff Petersen, a pastor at Lincoln Berean, said the church began considering armed security members after a gunman in Colorado last year killed four people and wounded five at two churches. In that case, a volunteer security officer with law enforcement experience fired on the gunman and stopped the attack, according to authorities. The gunman later died of a self-inflicted gunshot wound, police said. "We want our people to know we care about their safety and we're aware of the unfortunate possibilities, so it's important for us to be proactive," Petersen said. "We just felt like it would be the worst possible day in our church to be unprepared for that kind of thing." Annis, a former peace officer and martial arts expert, said a properly trained staff could mean the difference between an exchange of gunfire and a defused encounter. He recommends that parishioners drop to the ground while trained security members handle the situation and call in the authorities. Annis, Evans and Petersen said their guards have never needed to open fire during a worship service. In fact, most of their security efforts involve parking lot thefts and vandalism. They hope they never have to face a more serious security threat.